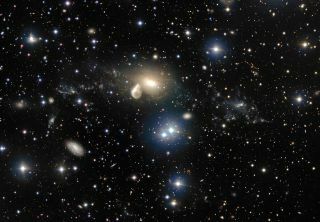 Elliptical galaxy NGC 5291 is at center of this image from the Very Large Telescope. The image shows the aftermath of a cosmic collision about 360 million years ago. The aftermath of an old galactic collision, which formed a very unusual dwarf galaxy, shines brightly in new images from the European Southern Observatory's Very Large Telescope in Chile. More than 360 million years ago, the galaxy NGC 5291 got a rude wake-up call when another galaxy plowed right into its center. The smashup threw gas into space, which eventually gathered into a ring encircling NGC 5291. ESO astronomers revealed new images and a video of the galaxy crash scene, located 200 million light-years away in the constellation Centaurus, today (Dec. 9). Some of this material ended up forming new galaxies of its own, such as NGC 5291N — a small dwarf galaxy on the right side of the picture, much less bright than its older neighbor. The dwarf galaxy has no older stars, but astronomers suspect that collisions of gas within the galaxy may result in some weird physics. For one thing, while dwarf galaxies normally contain very old stars, NGC 5291N seems to have only young ones. This annotated photo shows the elliptical galaxy NGC 5291 and the unusual dwarf galaxy, NGC 5291N, that formed when another galaxy plowed into NGC 5291's center. It also shows MCG-05-33-005, the Seashell Galaxy, which is also interacting with NGC 5291. "NGC 5291N doesn't look like a typical dwarf galaxy, but instead it shares a striking number of similarities with the clumpy structures present within many of the star-forming galaxies in the distant universe," European Southern Observatory (ESO) officials wrote in a statement. "This makes it a unique system in our local universe and an important laboratory for the study of early gas-rich galaxies, which are normally much too distant to be observed in detail by current telescopes," the officials wrote. This wide-field view shows the sky surrounding the galaxy NGC 5291 and the aftermath of its collision with another galaxy 360 million years ago. The system was previously observed by several other ground-based facilities, including the ESO's 3.6-meter telescope at La Silla Observatory, also in Chile. But more detailed information has been revealed with the Very Large Telescope's FORS imaging instrument and MUSE spectrograph, the ESO added.